Quartz Drywall|Blog|Uncategorized|Should You Hire an Expert Painting Contractor or DIY? What’s the benefit of DIY painting? The strongest argument here is the cost involved when hiring a painting contractor. There is no doubt that when you paint alone, all you have to buy is coating and brushes. Nothing else is good with such DIY jobs. Painting the house is time consuming and time wasted climbing ladders and making strokes on the wall is time missing from the family. Speaking of ladders, needless to say how dangerous it can be to climb up and down carrying brushes and paints. And then it also has to do with the results. No wall needs one coat. And although painting seems easy from afar, wait till you are done with a couple of walls. You will be exhausted. And the more exhausted you get, the less good job you’ll do. Not to mention the difficulty of painting the ceiling or the uneven and sloppy strokes when using the brush. Why hiring a professional painting contractor is better? The only shortcoming with professional painting services is the price you have to pay. 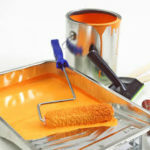 But this compensates for the time you save, the mistakes you might make when picking coatings or painting the walls, and the actual painting job. Painting contractors get everything organized. They help you choose colors. And that’s not always easy to do. You must find elegant tones to accentuate the aesthetics but without compromising functionality. And then it’s about the quality of coatings. Will you know which ones to choose for the bathroom and basement? And the advantages of professional interior painting services don’t stop here. Your house won’t be messy, the job is done awfully fast, the walls are painted correctly, and you don’t lift a finger. And don’t forget a nicely painted home increases its value too. Still bouncing between DIY and professional painting? Care for an interior and/or exterior painting service? They are both difficult projects. Inside you have limited light and hard to reach ceilings. Outside you need special coatings, must reach up high, and nature (wind, insects etc.) is not your friend. If your house is tiny and you are a DIY enthusiast, the project might be within your scope. In a different case, hire a contractor. Do you want to paint one wall only? If you just want to paint one wall or one room for that matter and you have some experience and time in your hands, go ahead and paint alone. But make sure the wall and trims are not damaged. Is your drywall in good condition? Speaking of damage, you should consider possible wall problems and thus possible drywall repair before painting over. And such jobs fall into the territory of pros. Will you paint the walls the same color? Have you ever tried painting white a red wall? If you need dramatic color changes, it’s definitely a painting contractor’s job.